SilverCare Organic Cotton Day Ultra Thin Towels provide a natural and effective hygienic protection thanks to their absorbent heart. Hypoallergenic and respectful of the intimate flora, it is composed of organic cotton that reduces the risk of allergies and irritation. Easy to use, its ultra-fine towels with fins fit perfectly and offer better support. Practical thanks to their individual pocket, they slip easily into your bag. 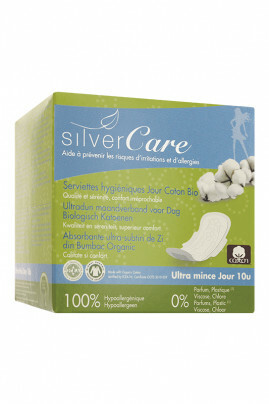 SilverCare Organic Cotton 100% Day Ultra Thin Towels guarantee comfort and discretion! Without perfume, without chlorine and without dioxane used during the process of bleaching, these towels are thus guaranteed 100% without pulp of cellulose resulting from the felling of trees.